Bermondsey Folk Festival 2016 puts folk, roots & blues music in the heart of South East London for the second year running. The free festival showcases some of the finest folk artists performing in Britain today with a series of events on the second week of September in and around the historic pubs of Bermondsey. 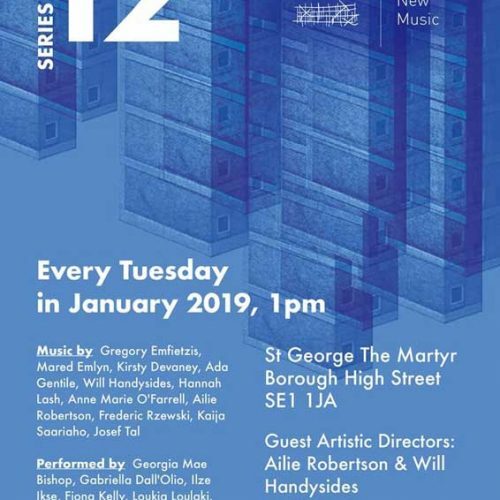 The festival is organised by The Blue Bermondsey BID and Grosvenor UK in conjunction with Cunning Folk Music to recognise the cultural growth of the Blue. Vicky Martin sings and plays guitar, banjo, Kandela and Irish Bouzouki. She is the writer of many the Delta Ladies’ original tunes. Vicky was interested in music right through the sixties and seventies and was initially influenced by the great players who were around throughout that period, Clapton, Hendrix whom she met, The Stones, and the music of Miles Davis and Bob Dylan have remained constant favourites. Dee Stone – plays violin & piano – contributes to many of the Delta Ladies’ original tunes. She started in the music business working on the Sound Team at Hammersmith Odeon and met many famous names of the day including Elton John, Johnny Winter, Ry Cooder and Bill Munro. The Delta Ladies, Roots, Americana, Folk, World, Blues. The band first got together in 2003 to explore the connections between British, Irish and Appalachian songs and tunes that passed back and forth across the Atlantic, carried by waves of immigrants and visitors – morris tunes that cropped up in the Southern Mountains as fiddle and banjo breakdowns, black-face Minstrel songs that took root in the Cotswolds in the nineteenth century, the classic folk ballads whose themes of love, betrayal, murder, revenge and adventure appealed equally to North Carolina mountain people, Scottish Travellers and southern English agricultural workers. Not making a fetish of the crossover idea, however, Rattle on the Stovepipe also play purely Appalachian and purely British traditional songs, ballads and tunes – in fact, whatever they enjoy, feel a connection with, can get inside and want to share with an audience. They have performed widely, including in France and Japan, as well as most years at Whitby Folk Week. Thomas McCarthy comes from Birr in County Offaly in Ireland. The McCarthys family settled there generations ago. Thomas describes himself as an Irish Traveller, and come from a long line of old traditional singers and musicians who kept the tradition of singing strong. Alasdair Roberts is a musician (primarily a guitarist and singer) who is based in Glasgow Scotland. He has worked with Drag City Records since 1997and also released music on labels such as Secretly Canadian, Galaxia and Stone Tape Recordings. In addition to many collaborative projects, Alasdair also recently became a member of the English/Scottish folk quartet The Furrow Collective, along with Lucy Farrell, Rachel Newton and Emily Portman. The group’s first album At Our Next Meeting was released earlier this year. Late 2014 should see the release of a new album of self-written Roberts songs, which is currently being recorded. 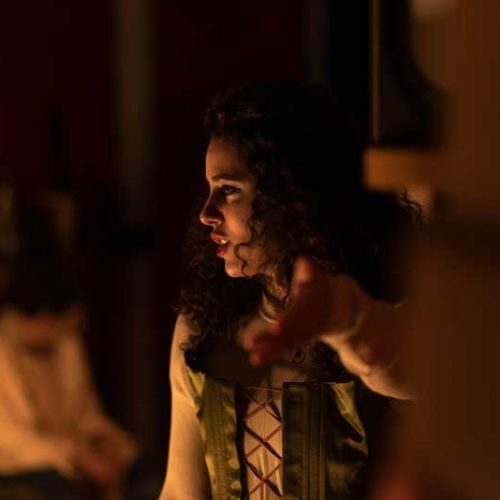 Both multi-instrumentalists, Laura and Adam accompany strong vocal melodies with guitar, shruti, flute, glockenspiel and a variety of percussion, layering sounds carefully and minimally to atmospheric effect. Together they create a unique live sound and as such Hickory Signals is enjoying a busy performance schedule and a growing following. Tim Jones is one of the most distinctive voices on the London folk scene. Able to alternate between mass singalongs and powerful stripped back ballads, his song writing and delivery of traditional material has been likened to that of Peter Bellamy, Nic Jones and Fairport Convention. He is regularly joined by Ted Kemp (Laura Smyth and Ted Kemp) on concertina and Karen Phillips on fiddle, and the band also run a popular English tunes session in Dalston. 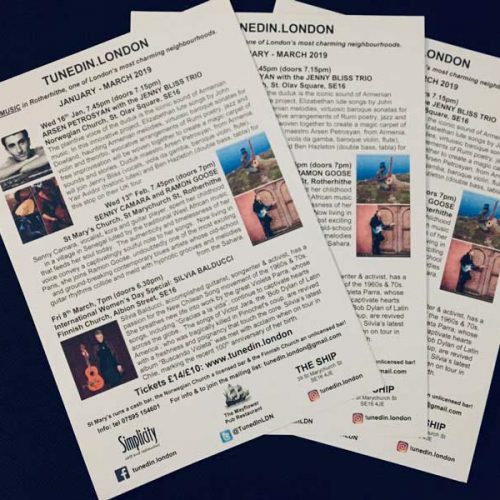 Hailed as “one of London’s musical treasures, playing the best Balkan and klezmer music in Britain” (Evening Standard), they have spent over a decade absorbing the rich folk music traditions of Jewish Eastern Europe, Turkey and the Balkans. Their evolution spans the origins of busking at East London’s Columbia Road flower market to performing in the famous concert halls of Europe including Amsterdam’s Concertgebouw, the Gasteig in Munich and London’s Southbank Centre. In 2008 we were awarded first prize in the International Jewish Music Festival, Amsterdam, and in 2012 were nominated for Best Group in the Songlines World Music Awards. As well as TV appearances and live sessions on BBC Radio 3’s In Tune and World on 3, they have performed at festivals such as Glastonbury, Cheltenham, WOMAD and Sziget (Budapest). They’ve just recorded their 4th studio album due for release in early 2017. Hailing from the old mining community of Church Gresley, South Derbyshire, Ruth Jacob started The Bara Bara Band after the split of legendary female folk duo The Lorcas. She joined forces with Rupert Browne of Juniper Leaf fame and the pair started writing songs together. They are accompanied by Boris Ming (of Juniper Leaf and The Precious Mings) on fiddle and Will Dobson on percussion. Stick In The Wheel are “ripping apart the preconceptions surrounding folkmusic” (Clash Music). Their now-trademark abrasive delivery of both original and traditional tracks, is not bland retroism, or empty nostalgia, but a voice linking now to then. Brought up in the thriving culture of working class London and cutting their teeth in its diverse musical landscape, they now bring those influences and attitudes to their traditional music. Stripped back to their bare components, their songs speak for themselves without ornament, telling tales of everyday life: carboot-swindlers, lorry drivers and London rioters, sitting seamlessly against traditional songs of prisons, hammer-wielding blacksmiths and 17th century madhouses. In addition to the gigs on weekdays, the Bermondsey Folk Festival runs two special events on Saturday and Sunday. Saturday will give attendees the chance to explore the Blue Market and the Blue Bermondsey with a series of events hosted across the area. Sunday will be a fantastic finale of the Festival thanks to the collaboration between Grosvenor and The Blue Bermondsey with family activities, community stalls and a traditional old fair attractions. Cunning Folk is a folk performer & music promoter & also runs the South East London Folklore society. In 2o15, Cunning Folk organised the Bermondsey Folk Festival 1st Edition followed by this year’s Festival. There are also plans to start the Bermondsey Folk Club. with performances across the The Blue Bermondsey BID area.